There are so many questions, concerns and philosophies regarding potty training. You have probably already received a variety of advice from a lot of different people with good intentions. Because this can often be a frustrating time for both children and parents, we want to offer you an approach that will help everyone be successful. 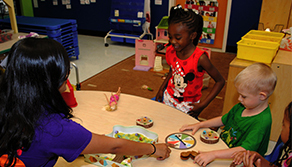 Our focus here at school is the social emotional and cognitive development of your child. Each child is different, and each family perceives potty training in a different light, however, there is one very important thing we need to remember—the fragile toddler ego. Helping the child to feel in control and confident during this time should be our first concern. DHC’s philosophy on any subject involving a child’s growth is first approached from a developmental standpoint, and second from a programmatic position. Most children show an interest in the potty before they are two but are not fully trained until 30 to 36 months. The first step is to provide a potty at home and let the child pretend with the potty and copy you. 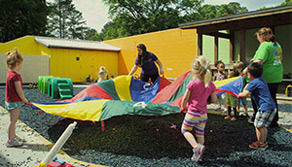 Children learn best through playful experiences, and they love to imitate adults. Even though they may be interested in the whole potty drama, they still need to develop in several ways before they can successfully and independently use the potty on a full time basis. Using the potty with adult prompting may work at home, but in our busy day at school we cannot facilitate this. Therefore, to successfully use the potty at school, the child needs to show interest here in the school setting and be able to express that interest. Language is the key. 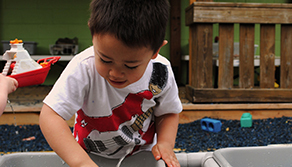 (Children with developmental delays may sign or use another form of communication to express their needs.) When a child shows interest, we offer the potty but do not force them in any way. The teacher may begin reading stories about the potty and introduce discussions about it. Using the potty should be your toddler’s idea without pressure or coercion. When your child is fully potty trained we may continue to use diapers at naptime if the child has accidents while sleeping. We recommend the book Toilet Training The Brazelton Way. Please do not hesitate to talk with the DHC Administrative Staff regarding this subject. We want this experience to be a happy one for everyone involved, especially your child.